Step into some happy time as you release your inner artist, turning these motivating and uplifting words into your own unique, inspirational art. 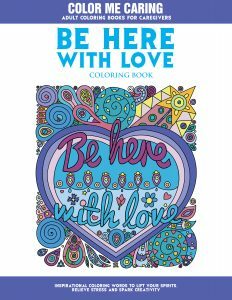 The first-ever coloring book for caregivers, Be Here With Love is an adult coloring book with inspirational sayings to calm your worry and lift your spirits, and was created especially to celebrate and encourage family caregivers. 30 original, hand-drawn illustrations featuring whimsical backgrounds and colorable words. Each illustration has its own dedicated right-side page for ease of coloring. Coloring is a way to keep your loved one company, and take care of yourself at the same time. Be Here With Love is also a thoughtful, uplifting gift to recognize and show appreciation for a special caregiver you know! The Color Me Caring Adult Coloring Book series was created by Meri Kelly and a few friends who took on the challenge of caregiving. We sometimes joke we’re in the “good daughter club.” We share our caregiving tips and free coloring pages at ColorMeCaring.com.